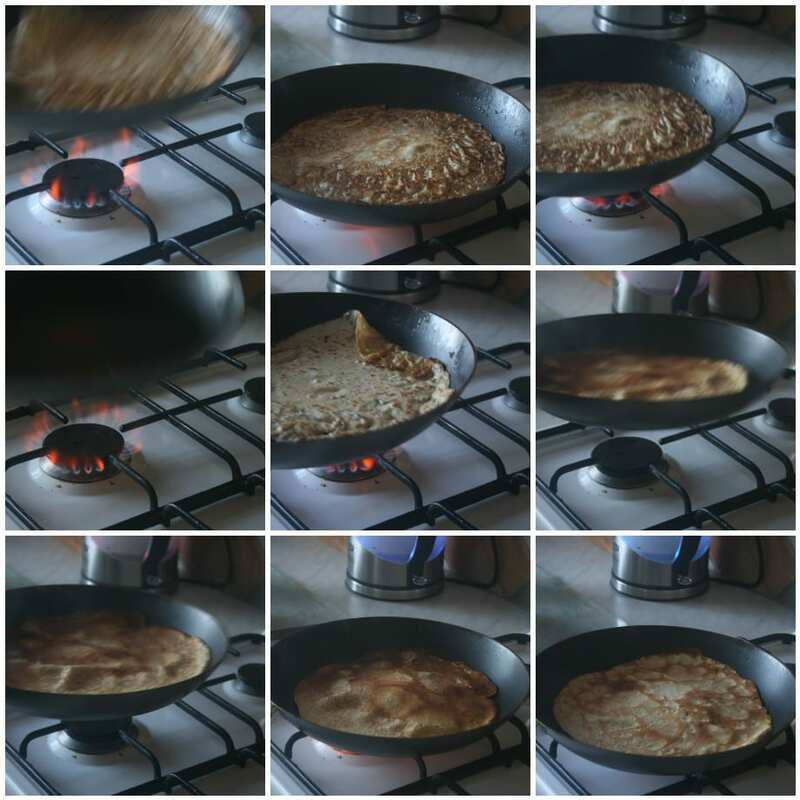 The past few years, I’ve used packet mixes, or my old housemate would make the pancakes, but this year I thought I’d have a go at actually making them myself, and of course I took some photos. I used Delia Smiths recipe from Waitrose’s website because it seemed to be the most similar to the one I remember my mum making. 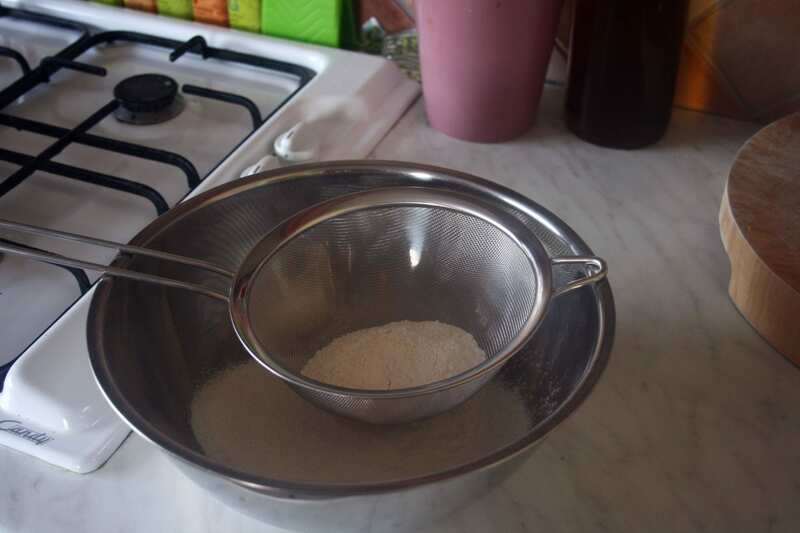 Sift the flour and salt into a bowl. Make a well in the middle and break the eggs into it. Whisk the eggs up, incorporating flour around the edges (first photo, I didn’t read the recipe properly and just got whisk happy.) 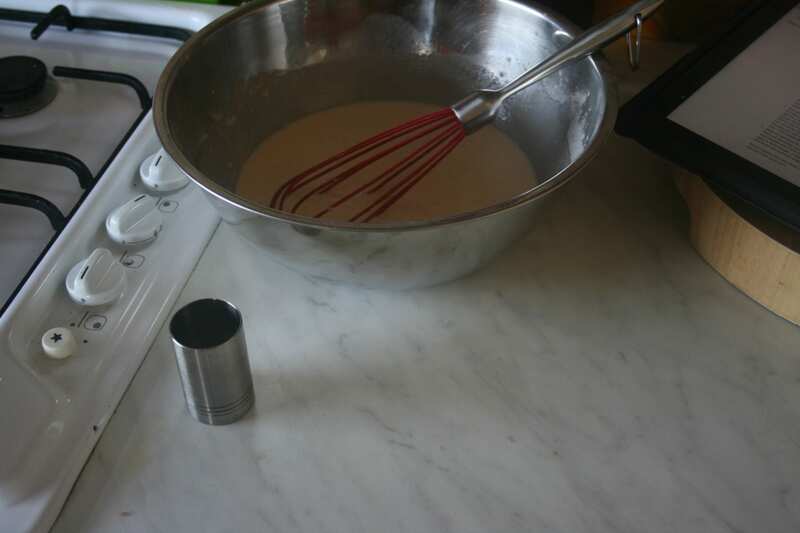 Gradually add in small quantities of the milk and water mixture (slosh it in), still whisking. Whisk until the batter is smooth, with the consistency of thin cream. 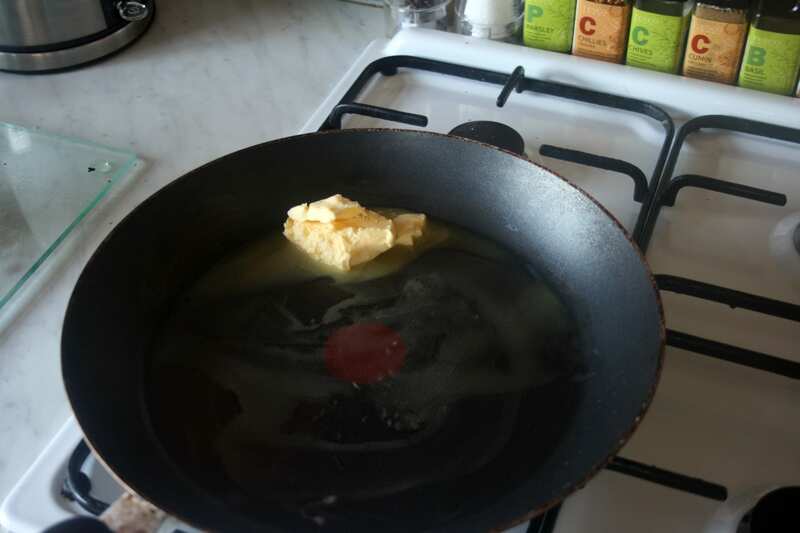 Melt the butter (and think, thats a lot of butter just to grease a pan. It really isn’t. Or my pancakes are just especially unhealthy) Spoon 2 tablespoons of it into the batter and whisk it in, then pour the rest into a bowl to lubricate the pan as needed. Delia (first name terms, we’re totes bff’s) suggests a 50ml ladle is perfect for the amount of batter you need. I don’t have a ladle with measurements, but I do have bar spirit measures. (Thanks Dad, I nicked these out of one of the pubs you had 3 years ago, along with a few of the Stella ArtoisÃ‚Â chalicesÃ‚Â and some pourers. Having parents who own a pub is bloody handy sometimes.) I used this to do my first pancake with the same sized pan she suggests in the recipe. 50ml is not enough batter. Silly Delia. 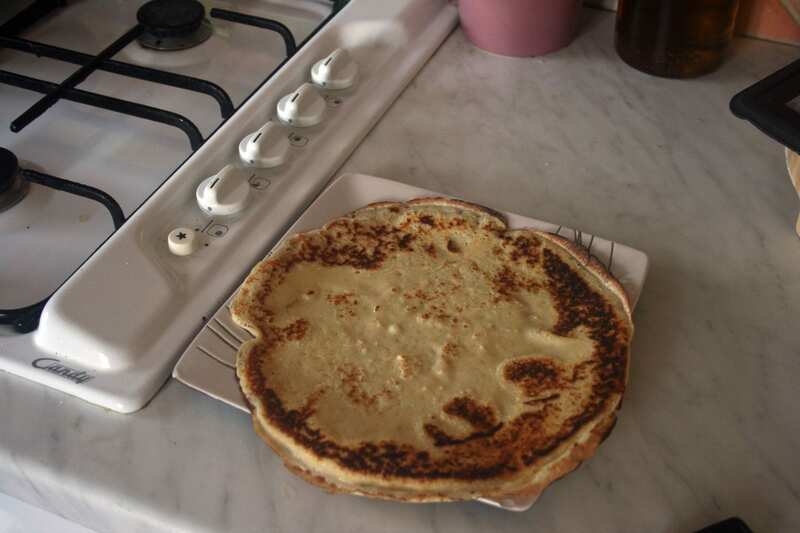 However her suggestion of a palette knife to flip the pancake was brilliant, and was bendy enough to lift the pancake at the edges. 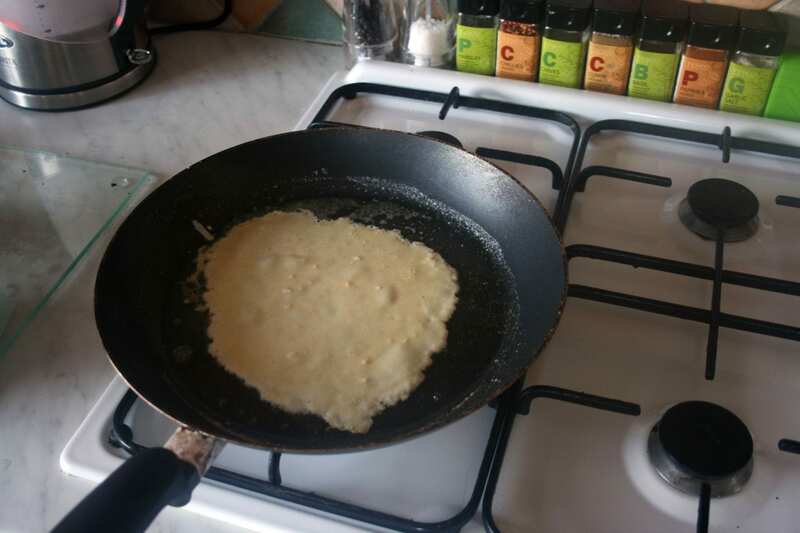 …but trying to take a photo of a pancake in the air with a remote in one hand and the frying pan in the other is unsurprisingly difficult! 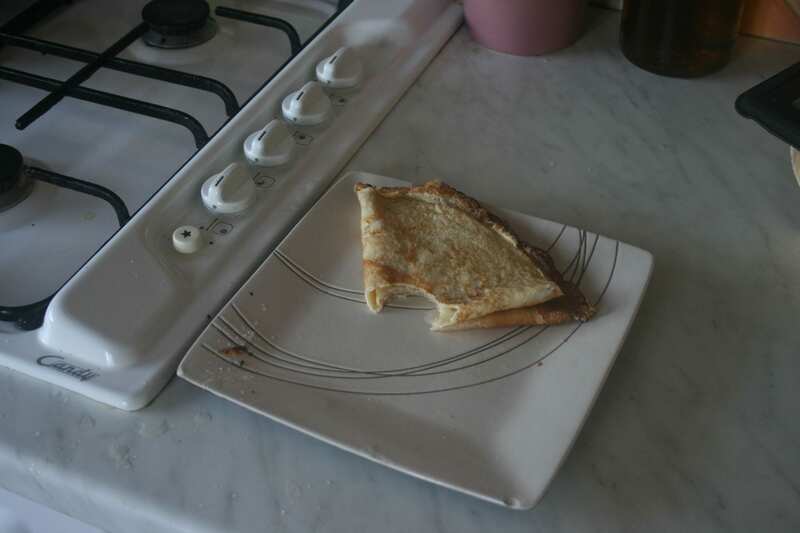 I eventually used up all of my batter, and popped the last pancake on my plate. And finally took a bite out of it quickly, dribbling lemon juice down my chin. Yummy! Why do we only seem to have pancakes once a year? They’re so quick, cheap and easy to make! * Anyone else a bit annoyed the supermarkets call it “Pancake Day” in their advertising? Oh my god Hayley. They look so yum. BRING ON TOMMOROW. Is it ultra sad if I go to bed early just to make it come sooner? I’ve been eating pancakes at every available opportunity for the past month. Sod the one day of the year for them! Even the Chief got onto my Pancake obsession, but since the frying pans in work are screwed, we have to get the premade nukable ones. Cheating, maybe, but NOM. Looking yummy but I’m sure you’re supposed to roll, not fold them! but I’m making proper ones later, yummy…probably with lemon curd. Totes put Ben & Jerry’s Phish Food in my pancakes. Massive heart attack worth it. I used this recipe and they were very tasty indeed. Jimmy insisted I make more for his return from America and they were just as tasty the second time – we put tuna/mayo/red onion in some, and in others butter-fried mushrooms. Final ones were the more traditional sugar and lemon!